It seems like a simple task, but attic cleaning is not to be taken lightly. While you can sweep up the worst dust yourself, a proper clean with attention to detail is needed every once in a while. We are the professionals you need. We can help with all cleaning and maintenance tasks related to attics, and have the tools and experience to do it well. We have years of experience cleaning attics. With perfected techniques and the right tools, we get the job done quickly and efficiently. In our cleaning, we get to every corner and every hard to reach bit of the attic, and leave it in the best condition possible. Who doesn’t want a more efficient home? Radiant barriers help ensure that excess heat doesn’t get in during summer, and thus keep the cooling costs down. We handle everything related to radiant barriers, and have the expertise to install them the right way. Radiant barriers are a type of insulation, but other types may be more suitable for your situation. 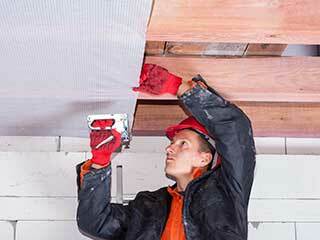 We can install any type of insulation in your attic, working towards keeping your home comfortable. A well-insulated attic makes it easier to control the temperature in the rest of the house. Rodents can destroy your attic and pose health risks to your household. Don’t let them get inside. We do proper rodent proofing, keeping your attic free of the little pests. If they have already gotten inside, we can decontaminate the attic for you. Attic maintenance doesn’t have to be a headache when you have the right resources at hand. We are experts in everything related to attics, and we’re ready to help you with any attic tasks you need completed.